The other old hand, the driving force, was Captain Herbert Kienzle, CBE, MBE (Military), MID, gold miner and planter in the Yodda Valley not far from Kokoda. Mobilized, like all other able-bodied whites in the Territory, Kienzle was incorporated into Angau with the initial rank of Warrant Officer. In late June 1942, he was chosen to take charge of native labourers on the line of communication being established between Ilolo (end point of a vehicular road from Port Moresby) and Kokoda. After beginning road construction at Ilolo (it was planned to build a road across the mountains! 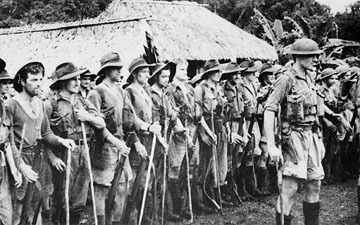 ), Kienzle was given the task of guiding B Company to Kokoda. 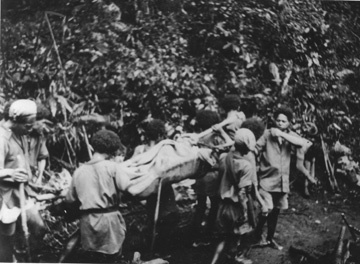 On 6 July he set out for Uberi, the first staging point along what was to become known as the ‘Kokoda Track’ (The term’ Kokoda Trail’ was coined by an American journalist in Port Moresby and was widely used in newspaper accounts of the Owen Stanleys Campaign. But, for the troops, the ‘Trail’ was the ‘Track’), to organize shelters and carriers for the mountain crossing. 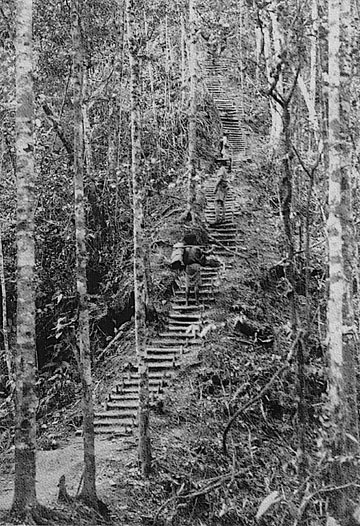 Until this time the ‘Kokoda Track’ had been simply a native pad considered passable only by natives or by patrol officers carrying little or no burden. It climbed mountains as high as 7000 feet, clung to the sides of gorges, descended precipitously to cross swift flowing torrents on moss covered stones or fallen trees, and then rose steeply again to traverse dankly dripping rain forests. Similarly, Kienzle organized staging points at loribaiwa, Nauro, Efogi, Kagi, Eora Creek and Deniki, often enlisting the aid of local natives. B Company crossed the mountains under better conditions than those surmounted by the thousands of Australians who were to follow them, but even with natives to carry their packs the trek was exhausting. On 19th July C Company moved up to Ilolo while unknown to the Allied Command an invasion force of Japanese sailed from Rabaul towards Buna with the intention of crossing the Owen Stanley Ranges and capturing Port Moresby. The heroic battles fought by members of the 39th Battalion are now well documented and need not be reported in detail on this page although there are references to recommended reading to be found on this website. Suffice it to say that thanks to the efforts of the 39th Battalion. and those troops who followed them, Kokoda now rates with Gallipolli as one of the definitive points in Australian history. The battle weary and ill clad troops, who came to be known as Those Ragged Bloody Heroes, who are shown here on parade at Menari have earned their right to the gratitude of all freedom loving Australians. They laid the foundations which resulted in the victory of The Battle For Australia.